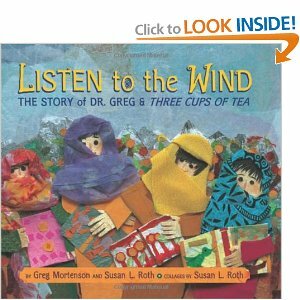 After writing more than forty children’s books, author and illustrator Susan L. Roth partnered with best-selling writer/ activist Greg Mortensen to write LISTEN TO THE WIND The Story of Dr. Greg and Three Cups of Tea. How did you come to partner with Greg Mortensen to write Listen to the Wind? Actually, through a big collaboration with my dear friend from California high school days at Tamalpais High School. Julia Bergman, President Emeritus of Greg’s organization, the Central Asia Institute (also recently retired librarian of City College of San Francisco) carried the first library to the first school in Korphe, Baltisan, Pakistan, practically on her back! I was in California one time about 14 years ago. We had breakfast together, and I asked her what she had been doing lately that was exciting. She told me all about her trip to Pakistan, activities with the Central Asia Institute and especially this school. She started with a description of the 24 different varieties of apricots that grow in the high valleys in Northern Pakistan and her images were so vivid that I could just see them in a collage in that moment. The story was compelling, too, and I said I wanted to write and illustrate a book about it, She said, “Do it!” And so I began. Incredibly, it took 12 years to find a publisher who was willing to take the chance to publish it. By the time I was ready to start the illustrations, it was too dangerous for me to travel to Pakistan, but Julia supplied me with essential photographs, books, artifacts, stories, and primary sources, all of which enabled me to create the book without actually traveling there. I still want desperately to go there, of course, and I shall as soon as it is a little safer. Greg helped too, with his first-hand reporting and his great knowledge of social and religious customs there. It is difficult to be aware of the subtleties of culture that are so very important when writing any book, especially one for children. I needed to be respectful and I needed to be accurate! With his and other’s help I think (hope!) I was able to be both. Did you know Listen to the Wind would be a best-seller? Absolutely not. No one can predict things like that. Why do you think made the book so popular? My gorgeous pictures? That’s a joke, Margot. Maybe my pictures helped a little, but surely the extraordinary success of the original book was the main reason. A close second was the brilliant merchandising of the three versions of the original story: grown-up, middle aged children’s, and picture book versions all were published together and inspired communities all over the country to do ‘whole town reads.’The result is the chance for book club type readings for whole families. It is interesting, uplifting, inspirational, an activity for everyone to do together. Was it difficult to translate a book for adults into the kind of story kids could understand and relate to? Not really. The story I tell is a very small piece of the whole, and I think it’s accessible to children since it’s about other children. They are different but essentially the same: kids and school. I heard Dolly Parton bought hundreds of copies and gave it to everyone she knew. No, much nicer and better. Dolly Parton is a major philanthropist with an intelligent, great and sensitive heart. She has a huge organization that provides books for children who otherwise might not be able to own them, all over the country. And she presents these books in a beautiful way to these children, by mailing them individually to their homes. I am a fierce admirer of Dolly Parton. Or something you know is going to happen? What do you think makes a book a hit with kids? If only I could predict that. You came out with A Dog’s New York, a sweet story about two dogs who keep each other company as they see Manhattan’s greatest sites. You rewrote the book after 9/11, re-titling it, It’s Still a Dog’s New York, transforming it into a book to help kids deal with the sadness, fear, and other repercussions of the attacks. How do you think being a New Yorker influences you as a writer? Maybe I am a “writer of place.” Or at least an “illustrator of place.” I think I definitely am that– it’s sort of visual collage or inspirational collage– I paint, so to speak, what I see, maybe? 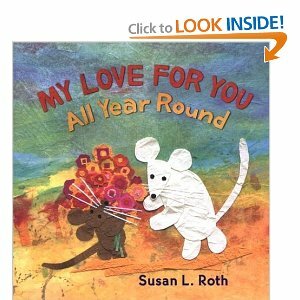 Even the pictures in my book My Love for You All Year Round was sort of a New York book. the pictures were inspired by my own garden and the river I see from my back yard. Did the stories you wanted to write about besides A Dog’s New York change at all after 9/11? I don’t know. Do you think they did? Maybe I’m getting meatier, more serious I mean, in my old age. I really would like everyone to appreciate other cultures as I do, and to love their children and other people’s children and to have no wars. But I think I always believed and tried to express this sentimental but reasonable stuff. I’m a softie with exotic appreciations, I always have been. I have an web site/ art project that kids can do to help teach these ideas. Also, or anyway, I have to cover both fronts. When I wrote It’s a Dog’s New York, I had just moved here and New York was still exotic and foreign to me then, another country, really. The original version was really the story of my first New York neighbor, stereotypically very bossy and New Yorky, but well-meaning. I started my blog ReelGirl, because I have three young daughters and was so frustrated with the lack of girls in starring roles in kids’ books and movies. Sometimes I feel like female authors don’t get it at all. Like why didn’t J. K. Rowling just make Harry Potter a girl? You will not get many people questioning her choices of anything in those books from the point of view of publishing success! The recently released movie hit “How to Train Your Dragon” was also based on a book by a woman with males in the leads. Then I wonder if my feminism is autocratic and stifling to creativity. My mother had the same frustration when she was a kid about the lame plots for girls. She went to the Little Red Schoolhouse in New York City and one of her teachers, Mimi Levy, wrote and published a book called Corrie and the Yankee about a slave girl who escapes from the Deep South. On the back of the book, Levy said my mom inspired her to write the story: “While she was teaching a fifth grade class, Jill, one of her pupils,complained that in books of adventure, it was almost always a boy who did anything of importance. Miss Levy promised Jill she would write a story about a girl doing lots of brave and stirring things.”Levy’s book came out in 1959, and here I am in 2010 blogging about the same issue! 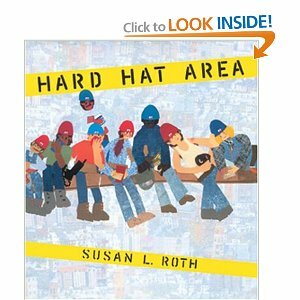 One of my favorite of your books is Hard Hat Area, about a real life iron worker, the only female among many men. You know that all the background photographs were taken from the balcony of your mother’s apartment in New York City, right? And that even she has a cameo appearance in the montage, somewhere! Collages of place! Oh, this is funny, speaking of your mamma. On the way back from researching that book, I used to stop in Paris to see your mother, every time. I had forgotten that until this minute. 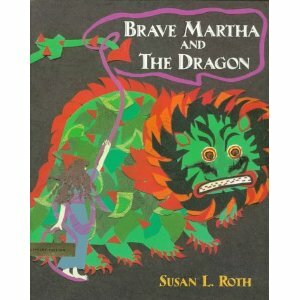 And also, Brave Martha’s model is my daughter who came with me on several of those French trips. I do paint what I see! I hear a lot of writers with girl protagonists featured in their books say they were inspired by their daughters. I love that! You also have a book called Princess, the illustrations are beautiful as usual but this protagonist talks a lot about her shoes and her gown. My mom told me you signed one of the original illustrations for my daughter, by mom never gave it to me because she said I wouldn’t like it. I feel bad about that! She may just have been in one of her more acquisitive moods. I’ll make her give it back. At least my princess was sort of naughty, and even though her mother finally made her go to school (you can’t really fault a mother for pushing education) Princess certainly tried to or at least imagines her rebellion first. And I guarantee that her mother would have made her brother, the Prince, get up and go to school too. If he had been the naughty one and if he had existed. …OK, but it’s the princess’s dominance in girlworld that drives me bats. Maybe that’s true with you– you’ve written forty books about all kinds of people and creatures, one just happens to be a princess. Very long prelude to my big question here: do you think about gender when you write? I surely did with Hard Hat Area— but the story presented itself pretty much as it is. Although the Princess-like heroine in real life is truly beautiful and even college educated English major (might as well get into class and education while we’re discussing) Kristen Doyle, her real name, decided she wanted to become an iron worker like all the boys in her family before her, at least 4 generations of them, and she still is a very good iron worker, too. I do not think I’d like to force the issue. Some people are boys. Some are white. Some people are rich. Some people are educated. What can you do? I want to tell the best stories I can write. Most of your books are illustrated with collages. They are so beautiful and unique, I can easily recognize them passing quickly by a bookstore window. Your very first books were illustrated with woodblocking prints such as The Butterfly Kiss and also Patchwork Tales. Is collage your favorite form? It’s spontaneous, immediate, and fast!!! Do you still do woodblocks? No, but I still love looking at woodcuts in museums and books and walls. What other kinds of materials do you use? I use anything if it’s not edible i.e. rot-able or bug-attracting or too fragile, but I only work in collage. You and my mother, who is a hand bookbinder, collaborated on The Christmas Story, a story about adoption featuring cats. The story has original handwritten manuscripts by you and is bound with needlepoint by my mother. It’s incredibly beautiful and was sold by the the great Paris bookdealer, Pierre Beres, for $50,000. The Catholic League was apparently offended that the cats had halos. They were very well behaved cats, even if not too religious. Besides, the story happened on Christmas Eve and it was a little bit holy by default. Do you think you’ll make a work of art like that again? If your mother could be pulled out of retirement, I’d do one in a minute. I still have a whole set of collages left over from our second book that I never could quite get around to finishing before she moved away from Paris. Answering your questions! And also, illustrating a book about the Watts Towers in Los Angeles on a tight deadline. And another, about an incredible, amazing scientist who has begun to solve some of the problems of world hunger by creating forests on the coast of Eritrea. And then ten small books for an e-publisher in Korea featuring my own grandchildren, against, what else, a background of New York City. Books of Place.